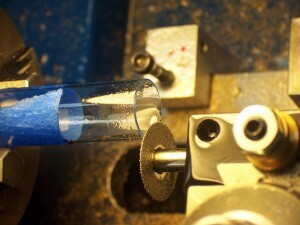 After I cut my tube and wrote this article I learned about some other ways to cut glass. 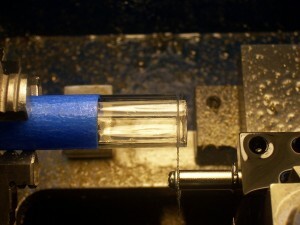 There’s one I’d like to tell you about because it looks like it’s an easy and reliable way to cut a glass cylinder that is too big too be held in a lathe chuck. 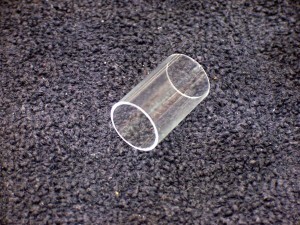 The author uses it to make drinking glasses from bottles. He gets smooth even rims by evenly scoring the bottle and then heating it with a torch just above the line to get it to break there. He then goes on to tell you how you can round and polish the edges. The only problem with his article is that he talks about the importance of accurately scoring the bottle, but he doesn’t really provide any details about how to do that, other than telling you to buy an inexpensive commercial jig or make one yourself. So I’d like to suggest mounting a glass cutter on a height gage type device and then turning the bottle against it while they’re on a surface plate.